Everybody complains about sharing airplane armrests but Michael Batt is trying to do something about it: Considering that no one likes the middle seat anyway, why not sell it as two half seats that aisle and window fliers can share? At a time when airlines are rolling out ever-more opulent options for those sitting up front, Batt’s proposal is just one of several that seek to make the term “comfortable coach seat” something other than an oxymoron. It’s safe to say that most passengers are fairly certain the balancing act, at least in coach, is in serious need of recalibration. Enter folks like Alireza Yaghoubi, who, as an engineering student in Malaysia, won a James Dyson Award last year for his AirGo seat, which promises to maintain your personal space even when the passenger in front of you threatens to recline his or her seat into your face. To accomplish that goal, the design forgoes bulky seat cushions for elastic, form-fitting fabrics and three motors that provide more recline with less intrusion. 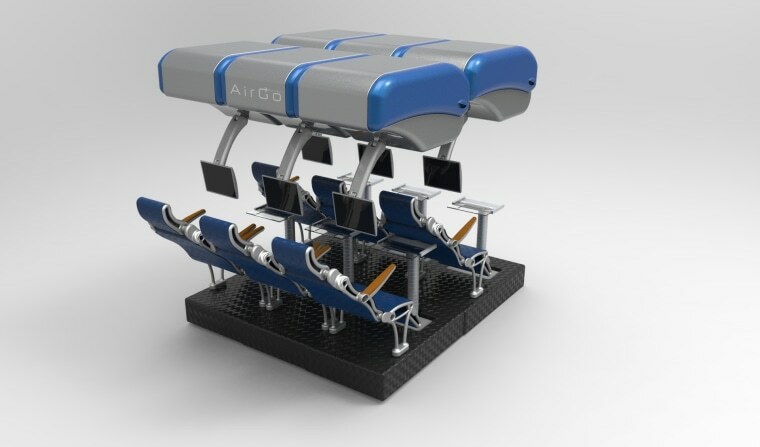 Add in telescoping tray tables and TV screens on articulated arms and the result is something that looks like a cross between a Nautilus machine and something out of "Star Wars." “Seating in airplanes today, especially the economy class, is like traveling back in time to the ‘60s,” said Yaghoubi, who is currently applying for a patent for his design. Then there’s the Side-Slip Seat from Molon Labe Designs of Denver, Colo., a three-across seating system in which the aisle seat slides partway over the middle seat during boarding. According to its creator, retired Navy test pilot Hank Scott, doing so expands the typical airplane aisle from 19 to 43 inches, easing one of fliers’ biggest frustrations and fostering faster turnaround times for carriers. The system requires the middle seat to sit slightly lower and set back from the other seats in the row, which provides two added benefits: staggered positioning for passengers’ shoulders and a middle seat that can be up to three inches wider. “Your shoulders are further forward or further back so the elbow space you’re going for is not the same elbow space they’re going for,” said Scott. And while the wider middle seat doesn’t provide any extra legroom, Scott believes it addresses the real issue of airplane crowding. Needless to say, you probably won’t find the AirGo or Slip-Seat on your next flight but for Rob Green of Dyson they’re part of a larger trend in which new materials and design ideas are allowing airline cabin designers to rethink passengers’ living space. Airlines including Alaska and United, for example, are getting ready to roll out new planes with seats that feature a slimmer profile and more ergonomic design than their predecessors. According to the manufacturer, Recaro Aircraft Seating, they provide more comfort and the potential for up to an inch of extra legroom. The real question, of course, is what individual airlines decide to do with that extra space.